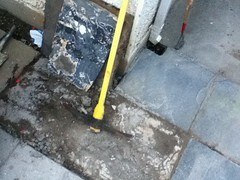 I RECORDED A MINOR victory in the Honeydo DIY stakes when closing up the Wavin covers around our home this weekend. My iPod Touch makes one vantage point look eerie in the photo. A big thanks to several readers who offered advice on detecting and correcting problems with home sewage systems. Although more needs to be done to completely fix problems we encountered during the humid Irish summer, I've reached the stage where we can restore normal ventilation in the house. This is a big win for me, even though a more sophisticated engineering job remains to finish the task. I'll take the win. Logged among my DIY links. 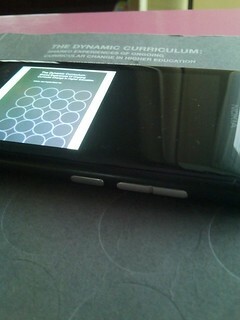 ONE OF THE MOST successful projects of my summer is the rendering of a 154 page journal into epub and mobi formats. I watched the work unfold during a syllabus-directed work experience programme with James Kennedy. The project proved both the strengths and weaknesses of Scrivener, one of the programs we use in Limerick Institute of Technology's e-publishing module. I wish the Windows version of Scrivener was as robust as the Mac version because I've been able to lose versions of my compiled work faster than I expected. This might be down to sharing the project between two different authors. It's good I encountered the snag because now I will be more forgiving during practical sessions with students. A short intro video plays after clicking the photo snapped for this blog post. It's also embedded below the audio clipped from the video below. FOR AS SWEET as it is, the wonderful program Scrivener will misbehave when used without proper version control. I have first-hand headaches regarding this issue. I use Scrivener a minimum of 10 hours every week. It makes easy work out of the course note creation process. Scrivener rewards me when I shovel unformed piles of notes onto its virtual cork board before reordering those notes into chapters of ebooks. But if I manage the flow by sharing an entire project (instead of documents within a project), Scrivener often loses page breaks, chapters and notes. This has cost me a day's worth of edits several times. We have lost nothing of substance--just edits. We back up work at the end of every day by selecting "Compile to Word" and then save that result in a folder that contains all .scriv projects. This "999" folder gets automatically backed up by Crashplan Pro. I have returned to edit documents that should've been finalized all this week and although it is frustrating I won't abandon Scrivener because of this version management issue. 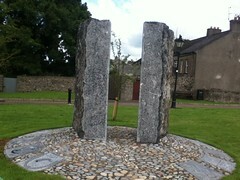 Instead, I'm putting the lessons learned into the e-publishing module at the Limerick Institute of Technology. Published to Say Media servers using the iOS Typepad app using my Three Ireland Mifi from Huawei E586. 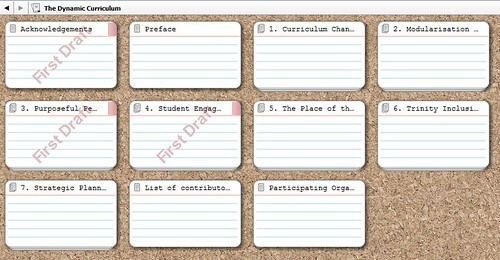 Saved as eprdctn on Pinboard along with links to resources for writers. I HAVE RINGING, buzzing and clicking sounds in my head that won't go away with some dreams. The dreams come back every year during the last week in August. Back in the late 80s, when I worked more than 100 feet underground, the stairs, tunnel and hardened concrete walls created an echo chamber. You could hear unique ring tones reverberating hundreds of feet down corridors when doors were left open. During the last three days of August 1988, there was a lot of incessant ringing of hotlines at my desk because we were frantically scrambling as many air evacuation flights as we could from Germany to the States. We had to move burn victims after Flugtag 88 to specialised care units because all the German intensive care facilities were saturated. We needed C-141s like the one in the photo. There are times I wish I had recorded the ambient noise of the airlift control center where I spent two years of my life. Doors didn't simply close, they locked in place because they were a foot thick and filled with concrete. Disc drives whirred along with tape back-up units that spun night and day. A telex unit banged away behind my head and 42 different phone lines were directly in front of my seat. Five of them had unique ring tones that would raise the dead. And over in the corner sat a grey plastic Deutsche Telekom phone that we used to call embassy officials. It also rang when called by Secret Service and Agency staff. Those guys had mobile phones that weighed more than my laptop and our German landline was programmed into the handsets. Because I wasn't allowed to wear earbuds while on the job, I heard the audio footprint of our control center for 12 hours at a time, four days a week. I don't think I'll ever forget the unique cacophony of sounds. Bernie Goldbach is saving memories for a journal. There's a novel in work. ON A WARM SUNDAY afternoon in August 1988, I watched little kids and big dads marvel as flight after flight of aerobatic planes smoked and roared overhead. Spectators got to see maneuvers that would not be approved over a crowd in the States because NATO airshow rules were in effect. I was helping to run an ice cream and hot dog stand just off the main taxiway at Ramstein Air Base. The airshow's maneuvering line ran straight down the runway, giving spectators a close-up view of modified fighter aircraft roaring by at 350 miles per hour. You could feel the effect and smell the roar of JP4. I didn't get that close to an eight ship of acrobatic jets even when flying the Lockheed C-141 for the 3000 flying hours I had logged with the US Air Force. My watch told me we were one nation away from finishing for the day. The Italian Frecce Tricolori were well into their routine and the UK's Red Arrows were in the holding pattern ready to rock the crowd and finish Flugtag 88 with a bang. I WILL NEVER be able to sell ice cream in a truck. Because I have a horrible ice cream memory that starts with checking out a refrigerated van back in 1988. Along with a dozen friends, I planned to use the van to sell American ice cream to Germans at Europe's largest air show. 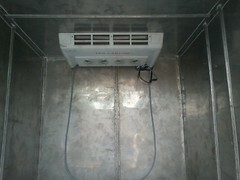 On August 27, 1988, I helped load the refrigerated compartment with gallons and gallons of ice cream. And we also had American hot dogs and American hamburgers too. From past experience, we knew the exact amount of product we would sell on a warm Sunday. And as history shows, the sun shone magnificently on Sunday, August 28, 1988. Nearly 300,000 people gathered under blue sky and wispy clouds to enjoy displays of aircraft on the ground and in the air. Many of those visitors walked away with generous dollops of ice cream served out of the van we borrowed from a logistics supply centre. The van was excess to stock. It wasn't in regular use because it was designated as War Stock for use as a temporary morgue. There are no ice cream vans on the War Stock Vehicle List. Bernie Goldbach kept a journal of Ramstein's last Flugtag. I AM HELPING in a survey that may result in the reinstallation of some of the sewage lines outside a home and it's not easy. I already lost a weekend to this priority. Some of the suspect 4" pipes expect water to flow uphill. You can actually see discrepancies in the starting and ending elevations of the lines without using any special laser equipment. During the past month, several plumbers have measured the difference in elevation between start and ending points wherever the suspect sewage lines turn corners. One of the plumbers thinks the current pipe does not drop 1/4" per foot. In fact, one six metre section of pipe falls backwards. I'm helping to dig up and reinstall the pipes but it's actually a job for a qualified engineer, so we're looking at Tradesmen.ie for ideas. I think the job requires a crew with construction laser measurement that corrects the current errors in the way the pipes lay in the ground. Too steep a drop and water flows over solid sewage instead of pushing it out into the main line. I'M LOOKING BACK on photos that document the construction of a new home, trying to figure out where to start investigating a leak. Foul air is leaking from a home sewage system, under floors and in toilets. The en suite toilet (shown before it was finished) and the attic air admittance valves don't smell. 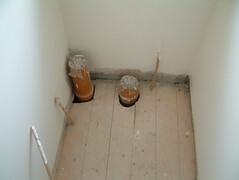 Part of the investigation centres on a review of pipes as documented in photographs because the home has no blueprints. After spending a half day mucking around (literally opening and spraying high pressure water into the outside access pipes), some of the smell has subsided. 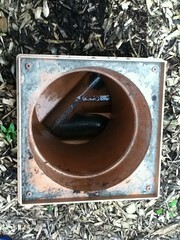 This suggests problems with the outside sewage lines. In the past, we've received helpful advice when I've posted issues on my blog and on Google Plus. If you're a reader with an idea, please drop me a comment wherever you spot this foul blog post. Bernie Goldbach curates DIY links. SUMMERTIME IN IRELAND isn't complete for me without a walk along the River Suir. It's a river walk that Huck Finn himself would have done, if his adventures were based in Ireland. For most of the Suir, you can look up and see the stars at night. I like the deep black night sky that I've seen along stretches of the River Suir in County Tipperary. You can see the moon reflect on clouds, deep space stars and occasional jets headed west. That's different from Dublin where city lights wash out the night above. 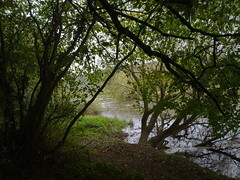 This summer's overly generous rainfall means mucky going along the easily-traversed trails aside the River Suir. For most of its run towards Waterford, the River Suir acts like a calm and placid little tributary--nothing like the roaring mass of water that threatens the quays of Clonmel. I keep a brochure on my desk at work that describes the River Suir's position in Europe’s network of navigable inland waterways. In its day, the Suir made industrial commerce possible by connecting traders to its navigable waterway throughout the entire reach of County Tipperary. Bernie Goldbach files this post in his travel collection. IN A WORLD where Twitter, broadcast networks and brands want to force eyeballs into their own spaces, I value my ability to cull content through Really Simple Syndication (RSS) newsfeeds. I read a lot of the world around me via RSS feeds. Seven years ago, I pulled RSS feeds from Irish blogs onto my mobile phone. Reading the titles of blog posts from dozens of blogs was like viewing a river of tweets today. I liked the convenience and efficiency of having a mobile flow of information. It was powered by RSS. You have to look hard to find RSS on Twitter accounts nowadays. The RSS option is no longer displayed for individual accounts or for favorites, one of the most useful aggregates of information in my opinion. Removing easy RSS from Twitter is part of an overall strategy of driving eyeballs onto the main Twitter site and it folds into the Big Television Network strategy that will monetise Twitter in the years ahead. If Twitter is successful in exerting more control over its network of users, it can assert total control on the stream of information through its network. If Twitter truly controls the stream, it changes the concept of discovery. And as network executives know, changing discovery in broadcasting means you command the largest rate card.